Block Phone Number: Unsolicited Phone Callers Beware! First, you’ll want to block the phone number from calling you again. Each service provider has its own way of doing so. If you use AT&T, CenturyLink, Comcast, Time Warner Cable (TWC), or Verizon take a look at this article and follow the instructions to block a phone number. Here’s a list of phone providers and the maximum amount of numbers you can block through them. After you’ve block the phone number it should prevent the call from coming through. However, if you are unable to use Caller ID blocking, we recommend you simply ignore the phone calls. Some cell phones may allow you to assign a silent ring to a particular set of numbers or even block the numbers. Here are instructions for blocking phone numbers on HTC, iPhone, LG, and Samsung phones. Take detailed notes on the call you received, including phone number, caller ID, time, and nature of the call. Then, report the call to us. Next (or if you’ve already done that), visit the FCC website and report it there as well. You’ll be asked (via an online form) how you received the call (home, work, or cell phone), whether or not the caller left a message, details regarding the nature of the voice mail, how many times the call has occurred and when, and more. To see all the call reports we’ve written up, visit our unsolicited calls category. After reporting your call using the steps mentioned above, register your phone number with the government’s Do Not Call List. Note that phishing calls are not affected by the government’s Do Not Call List, as they are not legitimate telemarketing calls to begin with, and often originate from a location outside the United States. Do all this and you’ll be on the way to helping us millions of people suffering hours and days of wasted time answering annoying, threatening, and malicious phone calls. 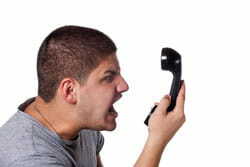 Here’s to one day living in a world where our phone rings only when we want it to! What’s the worst unsolicited or telemarketing call you’ve ever received?